Is race real or not? The idea of race is just that, an idea — a social construct developed in the 1600’s during the Enlightenment fervor to classify nature. Since these early efforts to categorize humanity’s immense variation, the idea that the "white" race is superior has been promoted and perpetuated by none other than the white race. Simultaneously, white people have discriminated against and loaded with stereotypes those they've labeled as "other races." 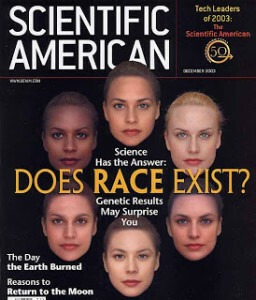 The combined effect has created the perception that race does exist and is attached to inherent human differences such as intelligence, emotional make up, and atheletic ability. Worst of all, this illusion has created massively different life experiences and outcomes for people according to assigned "race." The differences we observe along racial lines today are the result of hundreds of years of racISM, the sytem of allocating power and resources by racial categorization. Though race is not real; racism is very real. To learn more, check out this website created by the American Anthropolgical Association.